Earring jackets are the perfect enhancement to your stud earrings. We offer diamond earring jackets sure to add extra flash to your stud earrings. Hoop earring jackets are a fun addition. Perhaps something more elegant is needed, our diamond earring jackets add a dramatic complement to your solitaire studs. 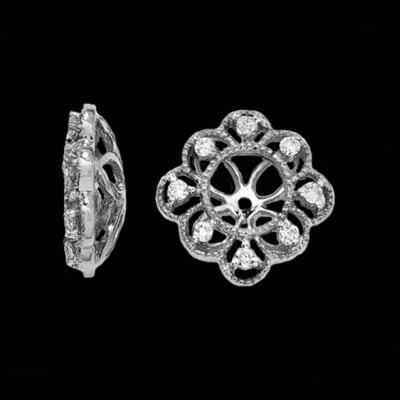 14k White gold earring jackets, pearl earring jackets, or yellow gold earring jackets, all great additions to your jewelry collection. Turn your favorite stud earrings into two pair when you wear a jacket with them. Whether you want to dress up or dress down, we have the earring jacket for you. Pretty diamond earring jackets. 14k White or Yellow gold diamond jackets measure 12.5mm in diameter and the diamonds total 1/2ct tw. Very nice diamond earring jackets. These earring jackets will hold up to a 7.75mm earring. 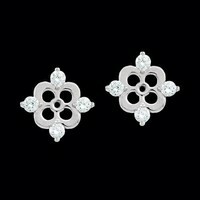 Lovely 14k white gold diamond flower earring jackets. This pair of diamond earring jackets is set with .59ct tw diamonds and will hold up to a 4.75mm round stud. The earring jacket measures about 15mm in diameter. Diamonds sit in each petal in this flower earring jacket and a cut design border gives this pair of jackets extra sparkle. Very nice diamond earring jackets. Fun 14k yellow gold "J" hoop polished earring jackets. Add a pair of hoop earring jackets to your favorite studs for an exciting change. These jackets measure 24m from top to bottom and are 7mm wide at the bottom. A great pair of earring jackets. 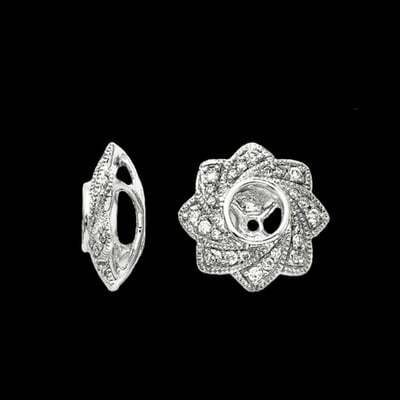 14k Yellow or White Gold Diamond Earring jackets. Each jacket holds 5/8ct of I1 G-I color diamonds for a total of 1 1 1/5 ct tw for the pair. This earring jacket will hold your 4 prong stud up to 1/4ct so a 1/2ct tw pair of studs or a 6 prong 1/3ct each side. Customize these jackets with your favorite gemstones. Beautiful earring jackets. Lovely 14k white gold diamond floral star earring jackets. This pair of diamond earring jackets is set with .34ct tw diamonds and will hold up to a 4.5mm round stud. The earring jacket measures about 12.5mm in diameter. Earring jackets turn your favorite pair of studs into 2 great pair of earrings. Fancy 14k White gold dangle earring jackets. 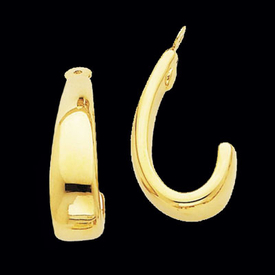 These delightful dangle earring jackets measure 25mm in length by 7mm across. Diamonds are dainty accent stones and total .02ct tw. A great pair of earring jackets to add to your collection. Elegant 14k White gold pave diamond earring jackets. These earring jackets are set with 1 full carat of diamonds and measure aprox. 12.50mm in diameter. These earring jackets will hold up to a 4.75mm earring. A beautiful earring jacket to add to your collection. Flashy 14k yellow or white gold diamond earring jackets. These earring jackets are set with 1/3ct tw diamonds and measure aprox. 12.50mm in diameter. These earring jackets will hold up to a 5.25mm earring. A great diamond earring jacket design to compliment your favorite studs. Fancy 14k gold diamond earring jackets. 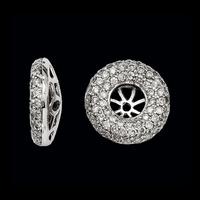 These delightful jackets measure 13mm in diameter and are set with 1/4ct tw diamonds. This great earring jacket design is available in 14k yellow or white gold. These earring jackets will hold up to a 5.50mm earring. 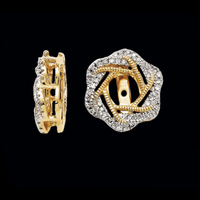 A great diamond earring jacket design to compliment your favorite studs. Simple yet stylish 14k gold diamond earring jackets. These jackets are each set with 4 .05ct tw SI1 clarity G-H color diamonds for a total .40ct tw for the pair. 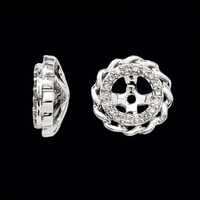 Diamond earring jackets measure 12mm in diameter and each will hold up to a 1/2 carat stud. 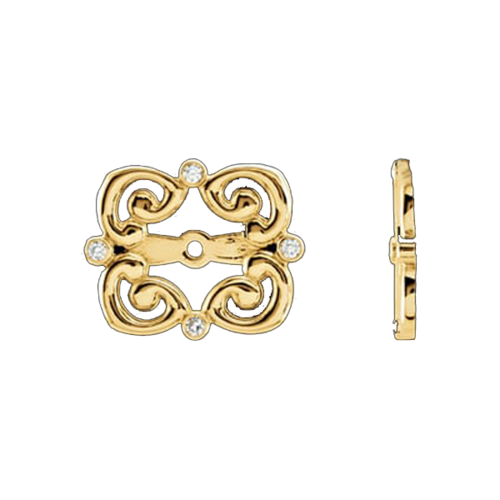 These diamond earring jackets are available in 14k White or Yellow gold and are custom made to order non returnable jackets. 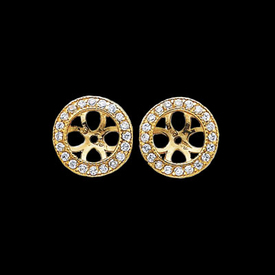 Earring jackets are a great way to dress up any diamond, gemstone, or pearl stud. 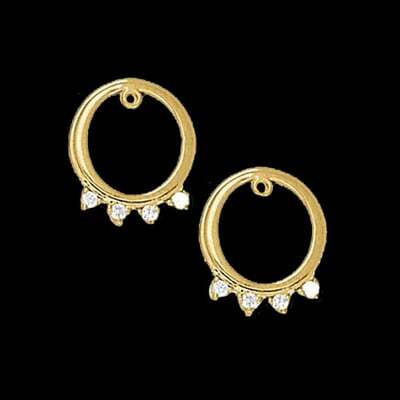 Order these earring jackets with genuine White Sapphire in place of the diamonds. An affordable alternative to the diamond jackets. 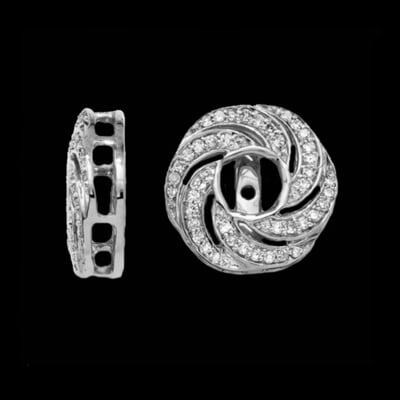 Swirled circle design 14k gold diamond earring jackets. Available in 14k White or Yellow gold. This pair of earring jackets is a great design and measures 14mm in diameter. Diamonds total 1/3ct tw and these jackets will hold up to a 4.50mm center. Great diamond earring jacket. 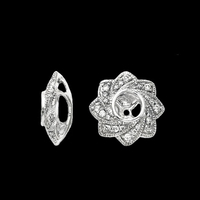 Pretty 14k White gold diamond earring jackets. 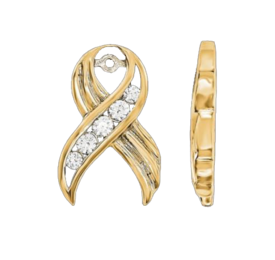 This earring jacket design is available in 3 great sizes starting with a dainty 9mm diameter size 1/10ct tw, medium size is the 11mm set with 1/6ct tw diamonds, and the large in this design measures 13mm in diameter and is set with 1/4ct tw diamonds. Center opening is 4mm on the small, 4.75mm on the medium size and the large jacket has a 5.75mm opening. Stylish Diamond earrings jackets. 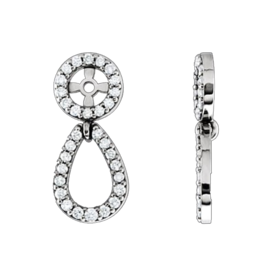 These exciting new earrings jackets are set with 1/3ct tw diamonds and the center opening measures 3.84mm in diameter. This design is available in 14k white (shown), 14k yellow, and 14k rose gold selections. 14k Rose gold diamond shamrock earring jackets. 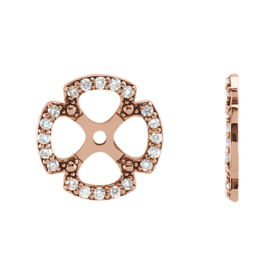 This design is available in 14k rose gold (shown), 14k White gold, or 14k yellow gold selections. Diamonds total 1/5ct tw in this pair of jackets. The opening measures 7.70mm in diameter. A fun earring jacket. 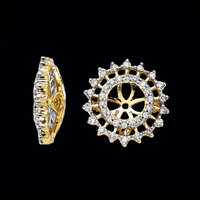 Pretty 14k yellow or white gold diamond circle design earring jackets. 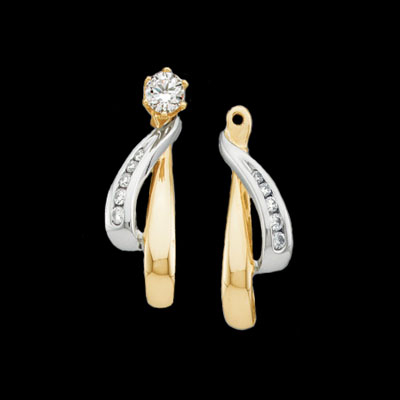 These delightful earring jackets are set with .12ctw SI 1 clarity H-I color diamonds. A nice addition to your favorite stud earrings. These jackets are available in 14k yellow or white gold. 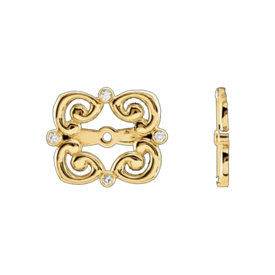 Fancy 14k yellow gold diamond earring jackets. Diamonds are dainty in this pair of earring jackets and total .08ct tw. This earring jacket design measures 14.5mm across by 12mm top to bottom. 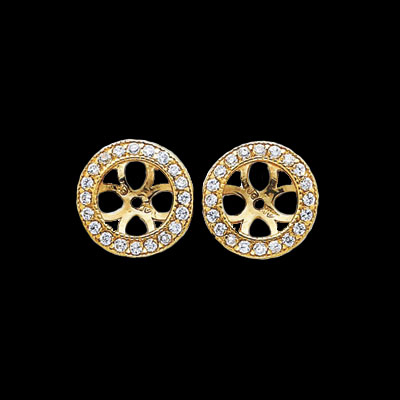 Earring jackets are a great way to dress up any diamond, gemstone, or pearl stud. Diamond Ribbon Earring jackets. 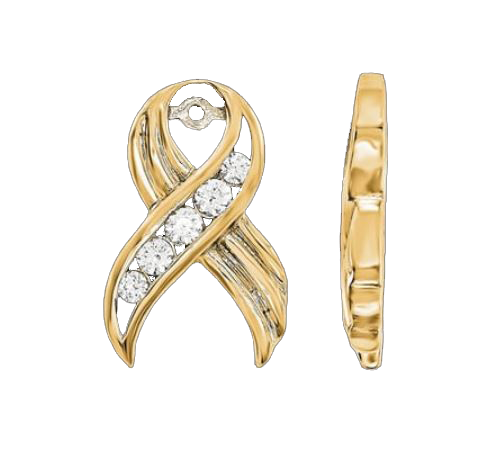 14K Gold Ribbon Diamond Earring Jackets available in Yellow or White Gold. Will hold a stud up to 3.4mm round. Fantastic jackets, you'll love this pair. 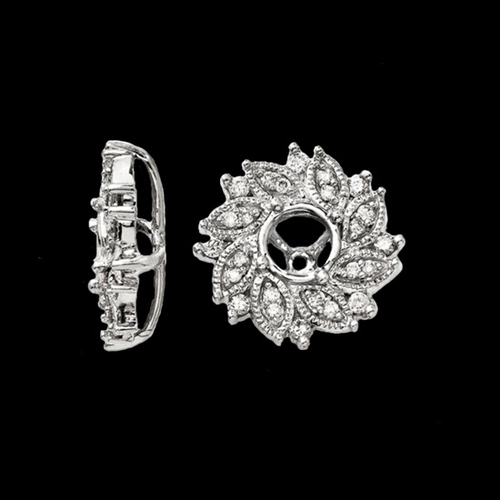 Earring jackets are the perfect accessory to your favorite earring studs. Diamonds are SI 1-2 quality, G-I color. 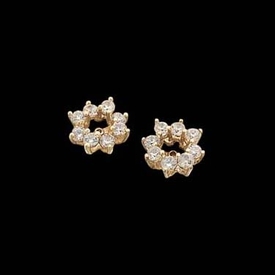 Dual trillion shape 14k gold diamond earring jackets. Diamonds encrust trillion shapes and total 1/3ct tw and measures 14mm. Available in 14k White or Yellow gold. 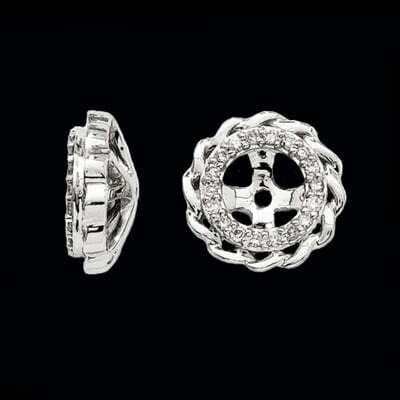 This pair of earring jackets is a great design and measures 13mm top to bottom by 12mm across. Great diamond earring jacket. Diamond Earring Jackets in 14K two tone gold. Incredible Design, these jackets hold 1/6ct tw diamonds and measure 25mm in length (1 inch). Channel set diamonds are I1 clarity, G-I color. Diamonds measure 1.3mm, 1.4mm, 1.5mm, and 1.6mm. Diamond jackets weigh 3.23grams. You'll love these diamond earring jackets, they feature a polished finish. Cute 14k White gold circle design diamond accent earring jackets. These jackets are set with .04ctw accent diamonds. 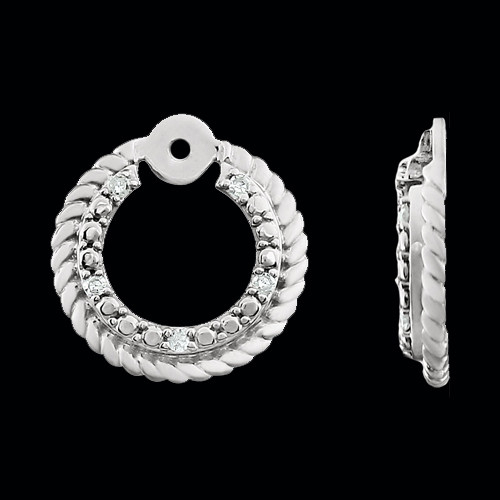 Rope design earrings jackets are an adorable addition to your favorite studs.